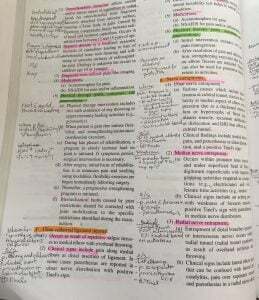 I often see NPTE review study guides being sold with “no highlighting or markings” after the PT board exam. I rarely see NPTE study guides being marked up (yes, they are not worth as much – however, this is a missed opportunity). I think to myself, what a shame that the study guides weren’t used as effectively as they could have been while preparing for the NPTE. There are some references such as textbooks that are meant to be “read.” However, NPTE study guides are meant to be used as an active learning resource when preparing for the board exam; that means you can actually write / draw / highlight in them! Let’s face it, preparing for the NPTE is not exactly the most interesting read, yet, it is important in order to get your PT license! When reading the study guide, you’ll want to avoid the mistake of reading cover to cover as well as other NPTE academic study mistakes such as covering one topic until done. Passive reading is an academic study habit, but to help be solid and confident on passing the NPTE, you’ll want to utilize active study habits. To help remember and retain the information better, utilize your other senses (kinesthetic, auditory and visual), such as writing your own notes in the margins. When not marking up the NPTE study guide, you’re missing an opportunity to reinforce concepts and information. Why Mark Up the NPTE Study Guides? When I was preparing for my own board exam, there weren’t as many nice pictures or charts, so I made my own notes in the margins. This helped me to remember the information better as I was able to summarize or interpret for easier understanding. Marking up the NPTE study guide is actively engaging in your learning rather than passively reading and glossing over the uninteresting material. Now I don’t mean mindlessly highlighting everything – that would defeat the purpose of actively learning. The goal is that you pick up on keywords just like you would for the exam. It’s not about everything; it’s about narrowing down important information. By making notes on the side or even within the text, you are reinforcing what you know. When I would look at my scribbles, drawings or notes – I viewed the annotated study guide as my own little “cliff notes” version of what I felt was important. Meaning — I took out the fluff and focused on what I needed to know. Why Mark Up the NPTE Practice Questions? The NPTE practice exam questions in the back of the NPTE study guides provide an opportunity to mark them up as well. By underlying / highlighting keywords in missed questions, it helps to understand what’s important to avoid making the same mistake again. Here you can see the arrows leading to written notes are to help simplify or “translate” to better understand what I needed to know. Marking up the NPTE questions helps your practice test-taking skills and reduces the number of errors you make on the actual exam. By being able to understand the information from the content and test-taking aspect, you will increase your confidence in being prepared for the therapy exam. When I reviewed the exam questions by focusing on what I needed to know, it helped to eliminate or reduce overanalyzing that can occur. At the end of the day, I was able to feel I accomplished more and retained the information better than just reading and memorizing the content. 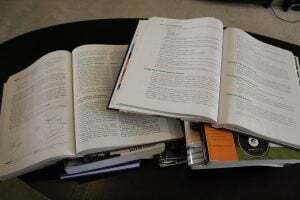 I found that when I was actively learning with the study guides, I improved my retention for a better understanding of the content information. This helped build my confidence up so that I could tackle any question with ease. I highly recommend that you also take a more active learning approach when utilizing the NPTE study guides. As you prepare for your PT exam, are you going to take the opportunity to mark up the NPTE study guides now?